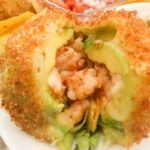 Mexican Stuffed Peppers | Mexican Appetizers and More! 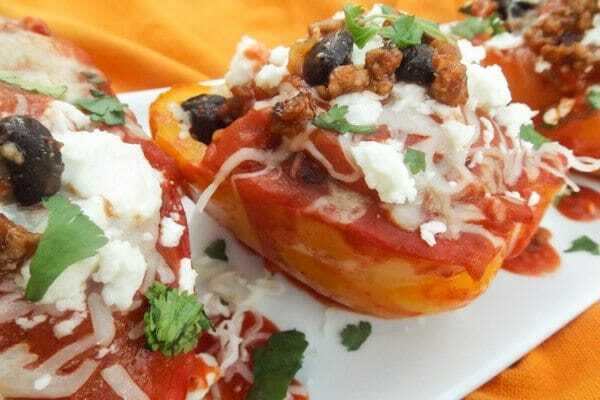 These Mexican Stuffed Peppers can be made with bell peppers or poblano peppers and stuffed with any kind of meat, seafood and even just with vegetables. 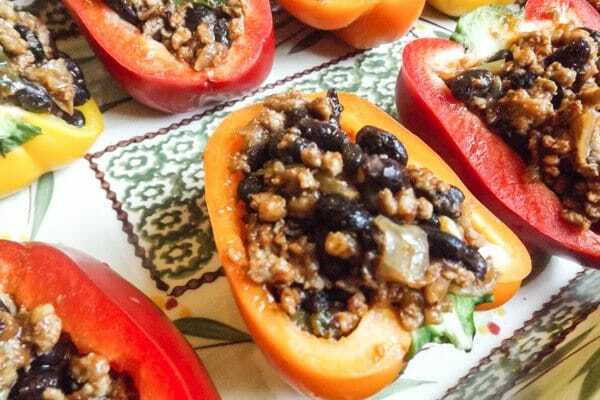 I decided to stuff these rainbow peppers with ground pork. But I didn’t stop there! I topped them with a super simple but oh so perfect homemade enchilada sauce. Which is absolutely a bonus! Some of us are use to making Italian stuffed peppers or as in my case, Puertorican stuffed peppers (which are just soooo yummy too!) 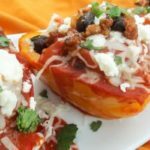 but Mexican stuffed peppers have their own uniqueness. And folks, a great tidbit from this here food blogger, diversity is key in appetizers! 🙂 The colors alone in Mexican stuffed peppers are so enticing and inviting. Eye popping luxuriance! And the flavors, the flavors just all come together so perfectly. The peppers, the meat, the beans, the onions, the serrano peppers, the cheese, the garlic, the cilantro and the sauce just come together and explode in your mouth like a volcano! 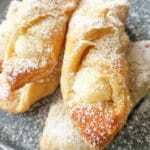 The first time I ever made these, my family forgot that we were having these for dinner. Yes they thought it was another mexican appetizer! So of course they went pretty fast! Miraculously one did survived the devouring of these here oh so pretty peppers. And then my adopted-neighbor son came over and took care of that! 🙂 And as they say, the rest is history! Friends make a lot of these babies because trust me they go fast! 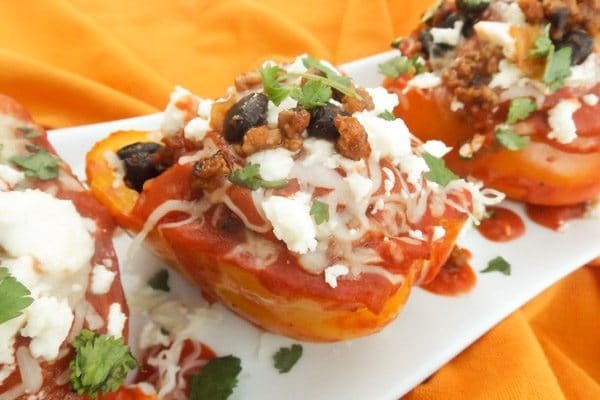 Note: You can also prepare this mexican stuffed peppers recipe in advance, freeze them and bake them when you’re ready. Great for a weeknight dinner. I will share a conversation with you…. Well an email and three days later, I heard the roar about them! So my friends please oh please give these a try!! You will love me later…promise! So make these and let me know what you think. In a frying pan, over medium heat, add oil and saute garlic for a minute. Add onion and serrano pepper, saute for 4 minutes. Add ground pork. 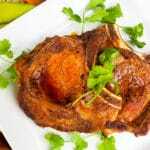 Break up pork with a wooden spoon, so it cooks evenly. Cook until meat is no longer pink. 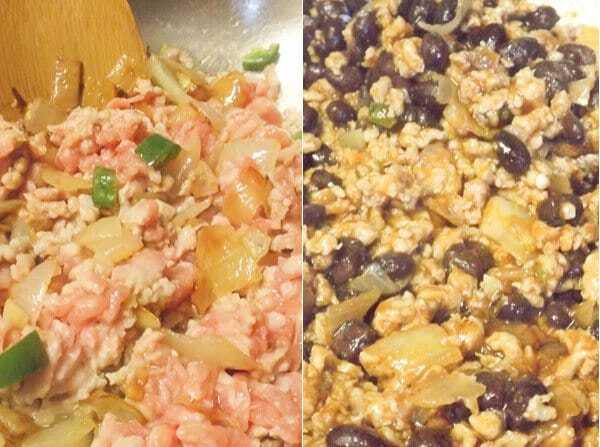 Drain and rinse black beans and add to pork. Add Goya sauce, cilantro and salt to taste, stir mixture. Cook for an additional 10 minutes. While ground pork is cooking, rinse and cut peppers lengthwise down the middle. Remove seeds and membrane. Stuff peppers with mixture. 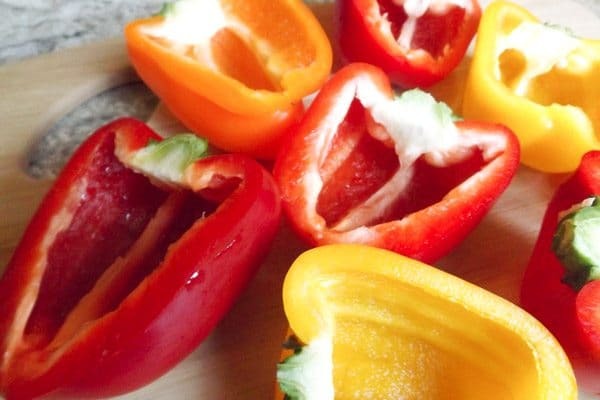 Place peppers on a baking dish or casserole. Set aside. Preheat oven to 375 degrees F (190 Degrees C). In a saucepan, over medium heat, add crushed tomato sauce and cook for 2-3 minutes. Add water, chili powder, cumin, and onion powder. 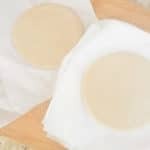 Cook sauce for a few minutes. Add salt and pepper to taste. Add sauce on top of each pepper and then sprinkle monterey cheese on each. Add some sauce to tray as well, so the peppers are sitting in the sauce. Cook in oven for about 30 minutes or until peppers are tender. Once done add queso fresco crumbled on top and some sauce. Serve immediately. 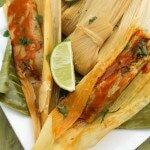 Making this for lunch today. Thanks for sharing.